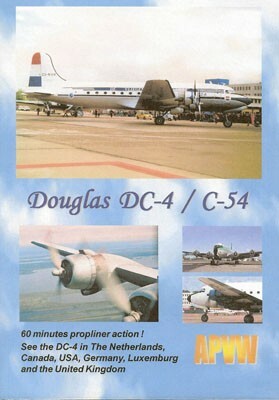 Douglas DC-4 C-54 is a DVD that offers footage of operational DC-4s in Canada, Germany, Alaska, Netherlands, and South Africa. In February 1936, Douglas began the design of a large four-engine commercial transport that would be capable of carrying twice as many passengers as the DC-3 over distances of 2200 miles. The result: The Douglas DC-4 / C-54 Skymaster! On February 14, 1942, the first DC-4, designated a C-54 Skymaster for the military, took flight and started the age of the four-engine transport. The production line closed in 1947, but many of the military variants found use in civil service. A total of 1,245 were produced. See the arrival of two DC-4s in the Netherlands. The Swissair DC-4. The SAA DC-4 and operational C-54s in use as cargo transport. Join us on board a flight over Berlin, Alaska, and The Netherlands. Experience the Skymaster in Canada and South Africa. The DVD is brand new and in NTSC format. Run time is about 60 minutes in color without any narration.